Miami Beach International Fashion Week, presented by Mercedes Benz, plays host to a variety of events and designers -- both established and emerging -- each year, and 2011 kicked-off with a blow out opening night party and fashion show, "WET," the W Hotel, South Beach, on Thursday July 14th, as a follow up to 2010's sell out success. Hosted by Salon Allure, a luxury resort, swim and fabric trade show, designers such as Diesel, Jessica Simpson, Belusso, Ed Hardy, and Martha Rey among many others, showcased their wares atop a floating runway at the W's pool, during the private event that was enjoyed by approximately 1,400 of the who's who of resort wear in the fashion industry. 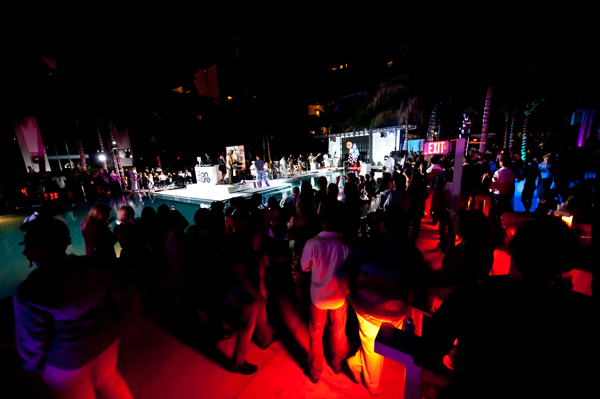 What made the W's event particularly interesting, aside from the bevy of beauties walking around clad only in the small swatches of fabric, was the unique blend of art, fashion and music that made the evening stand out among the multitude of goings-on in the South Beach area. 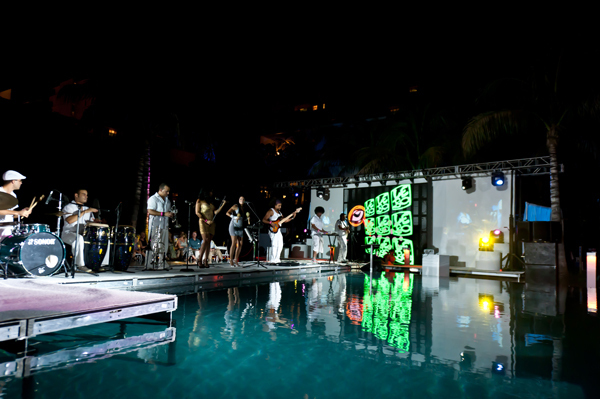 Aside from showcasing cutting-edge designs, the evening also acted as music venue, with a high-energy performance by Lanzallamas Monofonica, an eight-piece global rhythmic ensemble, and art gallery, with the cabanas around the pool housing the newest collections by fine artists LEBO and Mindy Linkous. 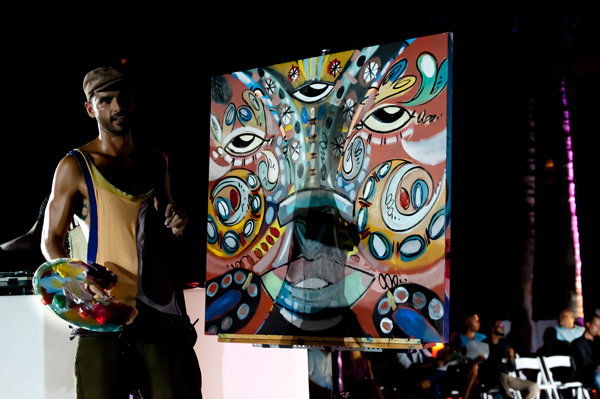 David (LEBO) Le Batard, is Miami's resident performance artist who paints live on stages around the world with some of the hottest names in the music industry, "I'm very happy to be part of this international event," LEBO said when I caught up with him, "and it's great to be able to contribute to what is shaping up to be a wonderful evening!" 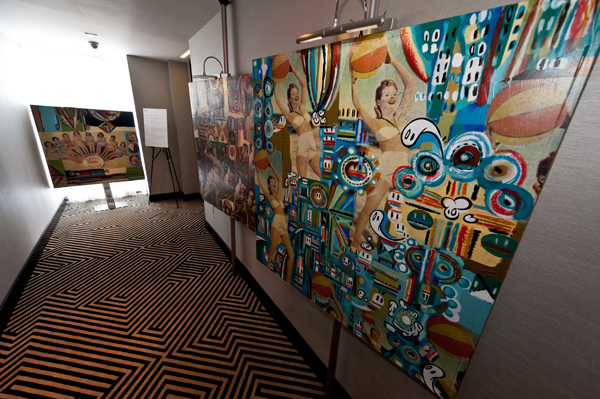 The oceanfront setting was also perfect for displaying the swim-inspired art by Mindy Linkous, whose primarily black and white canvases complemented those of LEBO, with his bold and colorful "post-modern cartoon expressionism," imagery. "It's an honor to be part of an event like Salon Allure Fashion Show," Linkous explained, "the blend of fashion and art is magical." 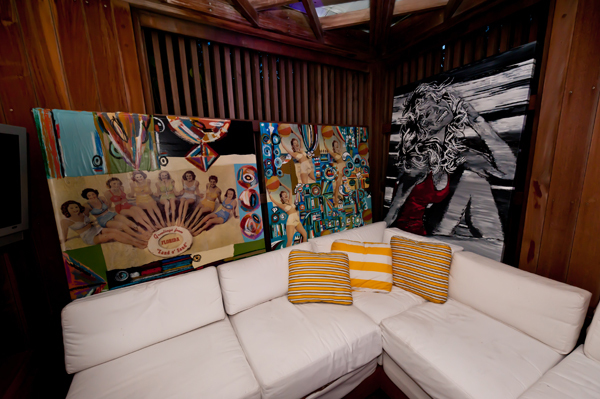 The cabana where Linkous and LEBO hung art was busy all night long, with many revelers taking pictures of the work, and promising to come back during daylight hours when the art will be displayed through Tuesday, July 19th on the 5th floor of the W Hotel. By 11 PM, LEBO was onstage grooving and painting with the band and Linkous had taken no shortage of photos with admirers of her work. At one point during the evening, I had the opportunity to speak with Ramon Contreras, VP of Latitude with Salon Allure, and his excitement over the event's success was palpable, "It takes it to a different level," Contreras said, "having LEBO and Mindy Linkous here has been fantastic!" Art Miami TV, which represents the gold coast region of Florida and aims to expand the art community and band it together, was also in attendance, "This event is fabulous," said Brandon Boston with AMT, "being from NYC and a photographer myself, I love how Salon Allure is connecting fashion and art." 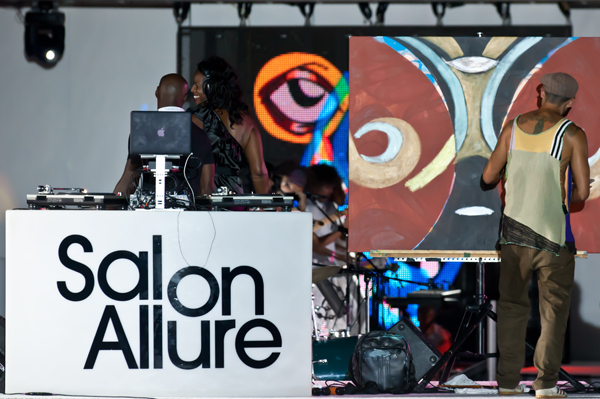 Salon Allure hosted events throughout the weekend with daily events, public viewing opportunities for Mindy Linkous' and LEBO's work, and a nightly cocktail reception at the Salon Allure Media Lounge on the 5th floor of the W South Beach.